Biography, pics, books for sale (inc. first editions) and CD available. 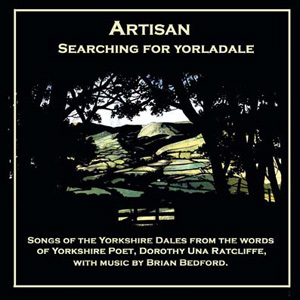 It was pure chance that one day back in 1987, when Artisan was a very new trio on the UK folk scene and still to make its mark, I came upon a book called Yorkshire Lyrics. The poetry of Dorothy Una Ratcliffe. I started reading and got hooked - and so did my husband and singing partner, Brian. He set a couple of the poems to music, White Dog was the first, if I recall correctly. Once Hilary (the other third of our trio) and I realised the potential, we encouraged him to write some more tunes and, gradually, a whole cycle of songs appeared, which started to lead us into more research. Who was Dorothy Una Ratcliffe? The book had no biographical information - we didn't even know if she was alive or long-since dead. We needed to know, not just for our own curiosity, but to ascertain where the copyrights lay, so I started to do some research. It turned out that we'd missed meeting the author, herself, by twenty years. She'd died in 1967, leaving no children. It took a while, but we finally tracked down Dorothy's last living relative, a niece, called Ludi Horenstein. Ludi helped us with a lot of biographical information, filling in the blanks and correcting the errors in the one available, but somewhat skimpy, text by Wilf Halliday. She also put me in touch with Dorothy's one-time secretary, who filled in a few more blanks. Gradually a picture emerged of a most remarkable woman. Ludi, herself an ex-ballerina and very keen on performance of all kinds, encouraged us to record the songs and also gave me information, books and family photographs which eventually formed the basis of a song-with-slide show we devised about Dorothy's life. She also gave her friendship. Sadly Ludi died in October 2004, leaving DUR's papers to Leeds University Library where, to my dismay, they languish largely uncatalogued. Please note I'm a private collector not a regular book dealer, but I'm happy to allow you to return the book within 7 days if not exactly as described. I try to make each description as accurate as possible, but I'm happy to answer additional questions by e-mail. (artisan at artisan-harmony.com). There are other Dorothy Una Ratcliffe titles available. Please e-mail if you're looking for something special. North Country Press, Leeds, No date. (Subject matter indicates 1920s) 90 pages. Original pictorial paper wrap. Yapp edges a trifle chipped. Illustrated with tipped in black and white photographic plates, a few small line drawings and a map. Pages are clean and uncreased with minimal age-yellowing. An account of the author's trip to Canada's wilderness in a logging camp in Northern Quebec on Lake Timiskaming. This volume also contains a few poems. Though little Dolly's family tree was rooted in Yorkshire via her Scarborough-born dad, George Benson Clough, she and her sisters were born and brought up in Sussex and Surrey. Her father was a barrister who married Rose Emily Russell.The family settled first in Brighton, and then in Oxshott, Surrey. Educated at the local high school, and then sent to finishing schools in Germany and Paris, she was encouraged to take an active interest in current affairs. The oldest of three girls, as a child Dolly was the ringleader, always hatching some grand scheme or other. The sisters produced their first (handwritten) magazine when Dolly was eleven. There was also a brother, Hugh, but he was excluded from the family history. Apparently brain damaged by a crippling bout of meningitis at the age of eleven, Hugh lived the rest of his life (into his sixties) in an institution, if not forgotten, never publicly acknowledged. Dorothy maintained (and visited) him, but apprently always had a strong fear of illness. Dorothy was educated at the local grammar school and the sent to finishing school - at first in Germany (which she hated) and then in Paris, which she loved. She took singing lessons while in Paris - and shared a teacher with Nellie Melba, the legendary opera star. She had an extremely good contralto voice - and the music is inherent in her poetry. It wasn't until 1909, when she married Charles Ratcliffe, the heir and nephew of chemical magnate, Edward Allen Brotherton - later Lord Brotherton of Wakefield - that Dorothy came back to Yorkshire and put down her own roots. Dorothy and her sister Pauline met the Ratcliffe brothers, Charles and Victor while on holiday on the Isle of Wight. At first Dorothy paired with Victor and Pauline with Charles, but some time later the pairs shuffled round and Dorothy eventually married Charles. It seemed as though Charles saw, in Dorothy, woman who would be a suitable partner for an ambitious young heir, and indeed, he was right, though Dorothy's strong will meant that she was no doormat of a wife, and that soon led to problems. Victor - then engaged to Pauline - was tragically killed in 1916 during the First World War. Pauline went on to marry Robert Young and Rosemary - her oldest child - became a ballerina, later adopring the stage name of Ludmilla Mlada and eventually marrying (briefly) and becoming Ludi Horenstein, my source for much of this previously undocumented biographical material. Charles, in the meantime, was rising through the ranks of his Uncle's chemical business. Shortly after the wedding Uncle Edward decreed that the happy couple should live in a very modest house on the site of one of his chemical companies - which Charles had been given the management of. Dorothy thought the house none too fine and the location even less appealing, and she determined that it was not suitable for a couple of their station in life. So to prove a point she went out, auditioned for, and was accepted into the Carl Rosa Opera Company (no mean feat and proof positive of her singing talents). Edward Brotherton was furious when he heard that his neice-by-marriage not only planned to take a job, but that it was on the stage. He immediately gave Charles a promotion, a pay rise and a new house. Dorothy resigned from the opera company without ever having sung a note in public. Charles turned out to be a less than ideal husband, alienating himself from Dorothy through several extramarital dalliances. In 1916, suffering from a sexually transmitted disease which Charles had brought home, Dorothy eventually fled to her parents, only to discover them firm in their belief that marriage was something to be endured whether it was working or not. They sent her back to Leeds, back to her unfaithful husband. The cure for her STD left Dorothy unable to bear children and this was always a great sadness to her and probably a disappointment to Charles, too. Perhaps to compensate for her unhappy marriage, Dorothy threw herself headlong into social life in Leeds, supporting Uncle Edward, a widower, in his political career, and becoming his Lady Mayoress when he became Lord Mayor of Leeds in 1913-14. At 26, she was the youngest ever Lady Mayoress, helping him to equip the Leeds Old Pals regiment at the start of the First World War and becoming actively involved in resettling Belgian refugees. She also encouraged Uncle Edward to begin collecting a library of early books and manuscripts which eventually grew to become the Brotherton Collection, now in Leeds University. Dorothy, using her full married name of Dorothy Una Ratcliffe began to write plays, poems and character sketches. She retained the Ratcliffe name as her pen name for the rest of her life, often abbreviating it to the initials D.U.R. She was extensively published in the Yorkshire Post and the Dalesman magazine, as well as editing a literary magazine - The Miicrocosm - and having 49 books published in her lifetime. Her literary contemporaries, whom she persuaded to write for The Microcosm, included G.K. Chesterton and J.R.R. Tolkien. Edward Botherton not only indulged Dorothy, but actively encouraged her literary ambitions. The Microcosm was published from his offices in Leeds and probably financed by him. He obviously had great regard for her, not only as his nephew's wife, but as an independent and intelligent young woman and there was obviously great affection between the two of them. Through the 1920s, with her marriage to Charles deteriorating, and no way to get a divorce lest the scandal damage Lord Brotherton's political career, Dorothy found a bolt hole in the Yorkshire Dales. She bought a small country house, Laverton Grange, in Kirby Malzeard, not far from Ripon, and took to spending as much time there as possible. From Laverton she was able to explore the area on horseback - on her own favourite horse, Jerry, who appears in the song, Richard Ryder. She absorbed local stories and sayings, such as the ghostly tale of the White Dog of Yockenthwaite and the country saying that is central to Daisy Song - that you know that spring has arrived when you can step on seven daisy heads at once. But any chance of redeeming her relationship with Charles was clearly over. In the late 1920s, while on a cruise, Dorothy met Noel McGrigor Phillips, who was to be the greatest love of her life. It was obvious that Edward Brotherton not only knew about Noel (there's a photo of all three of them together) but that he accepted that Dorothy and his nephew Charles were going their separate ways. His will was written so that Dorothy benefited in her own right, not as Charles' wife. She was also an independent executor for his - by now important - collection of early printed books, the Brotherton Collection, and for his financial legacy to Leeds University - bequeathing money for the Brotherton Library building - still the main library for Leeds University. In 1930, when Lord Brotherton sickened and died, Dorothy was finally able to make a break and get a divorce from his nephew, Charles. By that time she'd fallen head over heels in love with Noel. There's a lovely family story about the process of Dorothy and Charles' divorce. Apparently, despite Charles' constant philandering throughout their marraige, Dorothy decided to let him divorce her for adultery (the options for grounds for divorce being very limited in 1930). So Dorothy and Noel went away for weekends, settling into hotels as a couple to allow Charles to collect evidence against them. At first, horrified by this obvious breach of good manners, Charles followed them to their hotel and marched up and down the corridor outside their room, singing one of Dorothy's favpourite songs, so that she'd know he was there. On subsequent weekends, when he realised that they weren't going to give in to propriety, he did send his private detective to gather evidence for a divorce, however, apparently Dorothy and Noel were such a sweet couple that when the detective asked questions of the hotel staff, the chambermaids lied through their teeth to protect them. Apparently it took quite a few weekends away for Dorothy and Noel to gain their freedom. Dorothy and Noel married and for the first couple of years travelled extensively - including a trip across Africa - probably because the scandal of divorce still clung to them. When they finally found a house, they settled at Acorn Bank - called, by them, Temple Sowerby Manor - in Cumbria. Dorothy always said that it would have been a perfect house if she could have moved it a few miles across the border into Yorkshire. The couple took great delight in travelling all over the world, but always, for part of the year, too their caravan through the Dales. Dorothy used to go out of her way to meet up with any Gypsies passing through, She had a fanciful (but probably not very accurate) notion that she had a small amount of Gypsy blood in her veins, so she always took their side in disputes - not always a popular move with the local landowners. Her Gypsy poems, Brough Hill Fair and Yorkshire Gypsy, come out of her deep love of Romany culture. Brough Hill Fair was written as a protest when the Government closed the Gypsy Horse Fair at Brough in 1941, during the Second World War. Less than a year later the decision was reversed and the fair allowed to continue. Dorothy and Noel were well matched, thriving on tempestuous arguments, quickly made up, and taking great delight in each other, however, sadly, their marriage only lasted eleven years. During the Second World War, while they were campaigning in Scotland to raise money to alleviate the war deprivations in Greece, Noel was taken ill with a kidney complaint stemming from a weakness left by injuries received in Gallipoli during the First World War. He died very suddenly, leaving Dorothy bereft. Croodle Beck was written shortly after Noel's death when she returned to his favourite place, the banks of a stream running through the grounds of Temple Sowerby Manor. The following summer she wrote, No Longer is Thou Here. Remember Alfred Vowles? After their brief fling in the 1920s they'd remained friends. A few years after Noel's death Dorothy married Alfred Charles Vowles, professional photographer. Curiously, she requested that Alfred change his name by deed poll to Phillips and therefore remained Mrs Phillips to the end of her life. This has caused some probems for people researching into the life of Alfred Charles Vowles, well known West Country postcard photographer, who seemed to disappear from the face of the earth in the 1940s according to the records. That deed poll, and his move north provides the answer. She spent her remaining years with Alfred, at Temple Sowerby and, later, retiring with him to a Georgian house in Anne Street, Edinburgh. Alfred died three years before Dorothy, and she made her final move to an apartment overlooking the sea at North Berwick. Dorothy continued to write poetry, character sketches and plays and was several chapters into her first novel when she had a major stroke at the age of 80. Though she did recover - enough at least to be able to be driven around her beloved countryside - she never wrote again. Three months later she had a final stroke and died. Unaccountably, on her death, all her books were taken out of publication, and are available now only in secondhand bookshops, most commonly in Yorkshire, and a few of them from me. From the library of Ludi Horenstein, the author's late niece. LH in pencil on front endpaper. Published by North Country Press, Leeds, 1928. 140 pages. Black and white photographic plates tipped in. Fold out map. Paper wrap, yepp edges a trifle chipped. Pages are clean and uncreased except for tear damage to page 130 (a plain page with photo attached) which has been repaired with clear tape - but photo plate is not damaged. This is the author's account of a voyage in her own 38 ton yawl from Falmouth round Brittany and back to Plymouth in 1928. Eyre & Spottiswoode, London, 1941 1st thus. (First published 1939 as 'News of Persephone), 224 pages. Blue cloth board binding. Spine faded. Map of Greece on endpapers Illustrated with black and white full page photographic plates taken by the author and Noel McGrigor Phillips (her second husband). Pages are clean and uncreased with a little age-yellowing. From the library of Ludi Horenstein, the author's niece. LH incribed in pencil on inside front endpaper. A detailed account of the author's trip to Greece in 1938. Erskine Macdonald, 1920. Original cloth-backed boards, spine faded. Pp. 136, (ii), uncut, with illustrations by Frank H.Simpson. Pages are clean with a little age-yellowing. Inscription on inside front page 'Hearty Birthday greetings from Molly Crisp' Scarce. Country Life Limited, London, 1937, 159 pages. Turquoise blue cloth board binding with decorative title and illustration embossed in silver. Illustrated by Maregaret Dobson with 22 full page pencil drawings and one colour plate. Pages are clean except for pencil marks on one page. Undamaged except for a slight edge tear on p 70 and a couple of corners a little creased with a little age-yellowing. A medley of poetry, plays and sketches built around cruises of the Sea Swallow in Scottish and Scandinavian waters.